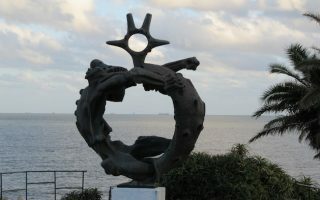 The capital of Uruguay, Montevideo is a city of 1.3 million on Montevideo Bay, overlooking the Río (river) de la Plata. 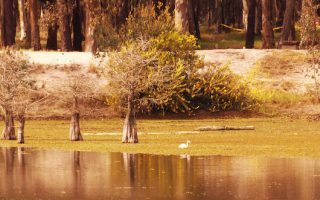 It’s an increasingly popular visitor destination, owing to its history, sandy beaches, important port, and great restaurant scene. The center of the city is the old Spanish Citadel of Plaza de la Independencia, which leads to the Ciudad Vieja (old town), with the newer part of the city, Carrasco, to the east. 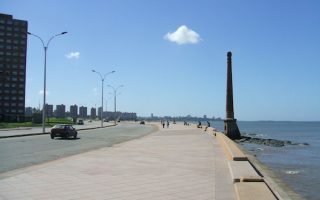 Running in Montevideo is mainly defined by the extensive coastline, which leads east for many km. 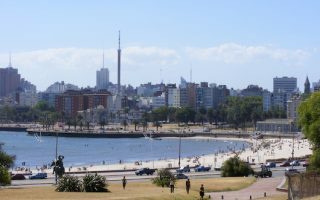 The best places to run in Montevideo revolve around the Rambla, a coastal road that has a series of multi-use paths and wide sidewalks along the water for 25 km. Bordering the western end of the Rambla, we’ve put together a lovely ‘runseeing’ tour of the Old Town. 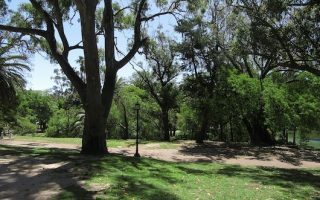 Rodó Park and Parque del Prado are the verdant running highlight in a city that does not have a lot of parks. For neighborhoods, there are some lovely side streets with nice homes coming off the water in Carrasco, and the Shangrila area near Roosevelt Park and the airport. The beaches in Montevideo are also great for running — we recommend Pocitos Beach, and the longer stretch from Playa Buceo to Playa Honda. The park & athletics complex around the soccer stadium boasts numerous paths and a running track. 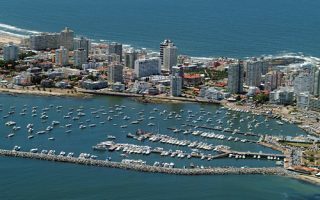 We also have links to our running guides for the popular resorts of Piriápolis and Punta del Este (100 & 130 km to the east). Within Montevideo, there’s a decent bus system. There are some local trains and three trail lines that go out to the nearer suburbs. Note there’s a ferry to Buenos Aires that runs 3 times a day and takes 2.5 hours. 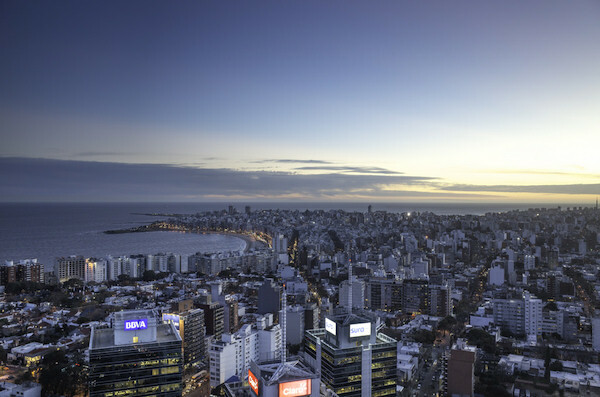 The signature run in Montevideo. A combination wide sidewalk/waterfront path that spans for 25+ km, from the Old City/Ferry Terminal to Carrasco. Great water views much of the way, with beaches that are also runnable. See table with segment distances. 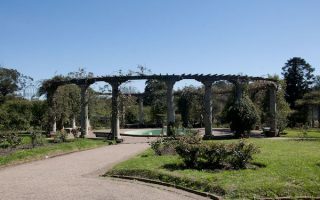 Our Rambla overview post covers the entire 25 km from Montevideo to Roosevelt Park in Carrasco, with info on segment distances. Here, we point out a few favorite sections & loops coming off this waterfront path, heading from west to east. Centrally located park with lovely, verdant criss-crossing paths. Grand fountain, museums, a music stand, and a small lake. For a longer run, head toward the Rambla, around the lighthouse, or enjoy some of the quieter side streets west of the park. Wonderful botanical gardens and park located 7 km northwest of the city centre. The park has 5 km+ of lovely dirt trails for running, including 2 km of paths along the river (Arroyo Miguelete). Nicely landscaped with roses, a fountain & garden arches. 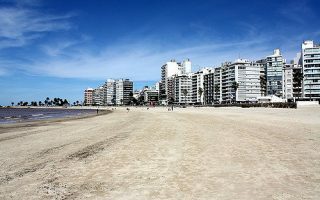 Montevideo has some of the best urban beach running in the world. The beaches are wide, flat, and feature firm sand. 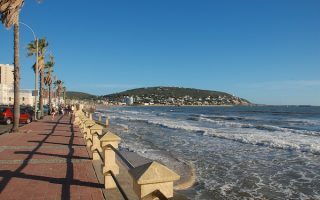 Highlights are Playa de los Pocitos, the 2+ km stretch from Playa Buceo to Playa Honda, and Playa Carrasco. 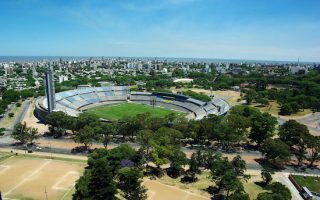 Estadio Centenario, is a 60,000 seat soccer stadium located within a larger park and athletics complex. Many roads and paths through a park and soccer fields, and a state-of-the-art running track. Also several other facilities & monuments. As a nice variation from the Rambla and beaches, create your own route through these upscale residential neighborhoods located 7 km east of Montevideo. Tree-lined residential streets featuring good sidewalks and nice homes, and some parks. Officially called "Children's Rights Park", this large park extends north ~5 km from the beach. Both wider and narrower wooded paths, fields, and a lake. Shangrila neighborhood east of the park has many quiet, unpaved residential roads good for running too. A great place to run if you're heading east along the coast toward Punta del Este. There's a 5 km waterfront path that has great water views, 3 km along Piriápolis Beach, and the challenging Hill of San Antonio! 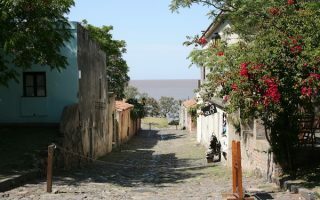 A 2-hour drive west of Montevideo, this former Portugese settlement in southern Uruguay is a popular visitor destination. Good running along the waterfront (Rambla), Barrio Histórico, on beaches, and some rural agricultural roads. 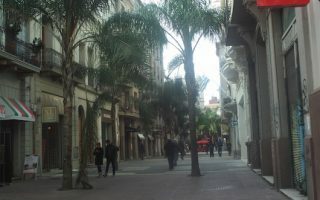 Montevideo has a humid, subtropical climate, with hot summers and mild winters. Running conditions are excellent year-round. 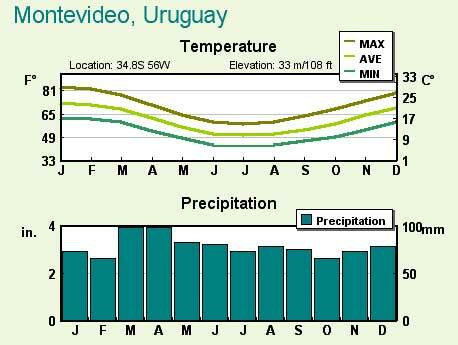 Average summer high temperatures (January-February) are in the 28C (83F) range, with warm but not oppressive nights. In winter, the average high is 15C (59F), with lows dipping to 7C (mid-40sF). Precipitation is fairly evenly spread through the year, with frequent thunderstorms. Note the weather is quite humid, especially in summer — hydrate and try to go early or in the evening! From a running perspective, we highly recommend trying to stay near the coast, which offers access to the Rambla running paths. There’s a large variety of centrally located hotels in or near the Old City and just east of it, within 1 km of the coast. Another popular area to stay is the neighborhood near Pocitos Beach. There are no independent running stores that we could find in Montevideo. But there are outlets for several of the running shoe and apparel companies: Adidas, UnderArmour, New Balance, Nike, and more. Several of them are located in the Montevideo shopping center (see map). None of the stores offer group runs, but the Montevideo Runners is an active group with lots of resources.